Pop popcorn in an air popper or on the stovetop according to directions. Let popcorn cool and measure out 6 heaping cups. Add chocolate to a metal bowl and place over a pot of simmering water (the bowl shouldn’t touch the water). Stir the chocolate until it’s melted and smooth. Remove it from the heat. Stir together sugar, salt, and cayenne pepper. Drizzle the popcorn with 3/4 of the melted chocolate and stir together well. Sprinkle popcorn with about 1 tablespoon of the seasoning mix. Divide the popcorn into 6 heaps on 6 pieces of parchment paper. Wrap the parchment paper into balls and squeeze them tightly so they hold their shape. The parchment paper will make it so your hands don’t stick to the popcorn and also make it easy to remove. Add the wrapped, shaped balls to a baking sheet and place in the fridge for 10 minutes to harden. Remove popcorn balls from fridge and unwrap. 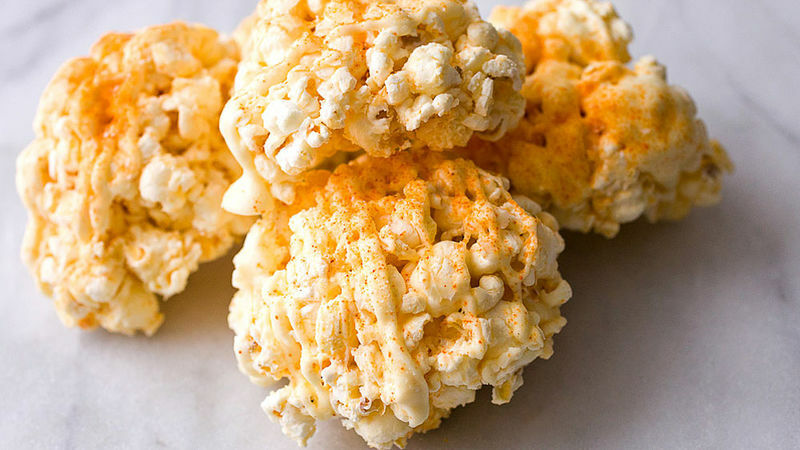 Drizzle popcorn balls with extra chocolate and sprinkle heavily with spicy-sweet seasoning. Store at room temperature for 3-4 days in an airtight container. While you are shaping the popcorn balls, you can insert a skewer into each one for popcorn balls on a stick!